A compound found in sunless tanning spray may help to heal wounds following surgery, according to research by biomedical engineers at Cornell University. Researchers at Ohio State University have developed a way to enhance how brain tumors appear in MRI scans and during surgery, making the tumors easier for surgeons to identify and remove. For astronauts returning to Earth, adjusting to full gravity can be just as demanding as any of the challenges they faced in space. While readjusting to Earth’s gravitational pull, astronauts can experience difficulties moving and balancing, headaches, nausea, and even fainting spells. The International Space Station (ISS) is falling. This is no threat to the astronauts onboard, however, because falling is part of the ISS staying in orbit. Avery Dennison (Pasadena, CA) offers medical-grade adhesives in a range of biocompatible acrylic, porous acrylic, synthetic rubber-based, silicone, and absorbent hydrocolloid adhesive formulations. Custom formulations are also available. The adhesives meet FDA and ISO requirements for safety and efficacy. 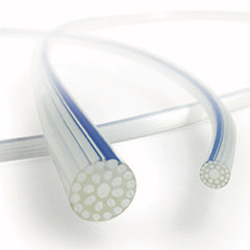 Vesta (Franklin, WI) has introduced medical-grade silicone kink-resistant tubing, which consists of a silicone inner and outer layer, with an imbedded reinforcing member that includes a spiral wind the length of the extrusion. The tubing is available with inner diameters from 1 mm to 6 mm.